Emulsifier extracted from soy bean, lecithin enables to stabilise emulsions and to prepare very light foams. Small 100g tamper evident pot. 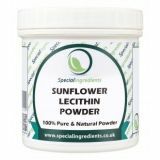 Please note that Lecithin is extremely sensitive to heat (sunlight, hot kitchen etc) and so must be stored in a fridge. Recommended emulsifier that can replace eggs (egg yolk is called lecithos in Greek), egg whites or other protein and hydrolysed proteins from milk, plants in most recipes. The tensioactive molecules improve the distribution and stability of fat in water sols like in traditional American ice cream (heavy and rich in fat) or Italian ice cream (Gelato type rich in eggs). Lecithins are an important ingredient in chocolate products (water in fat stability), butter and egg pastries (sweet dough like in brioche where they act as wetting agents and antioxidants), and in confectionery (wetting agent and antioxidant). They are used in high fat cooking margarine to reduce splashing and browning. Used to improve texture and stabilise phasing out of fat in reheated sauces and roux, also to avoid fat building up in stuffing and casseroles. High quality premium food grade. Shelf life of 2 years. Once opened please store in the refrigerator and use within 6 months of opening. 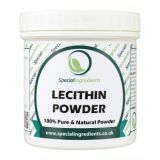 100% Pure Lecithin Powder (E322) (from Soya). Unopened store in conditions between 5-20C. After opening: store in fridge for up to 6 months. 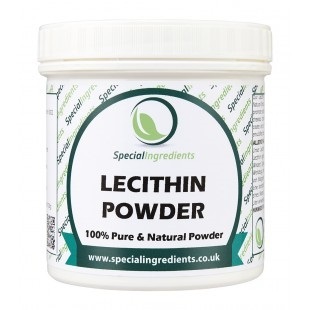 Lecithin powder can be emulsified into liquid using a blender. 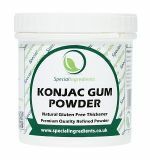 Dosage rates: 6-8 grams per 1 litre of liquid.